An active town centre church near the sea with Chaplaincy links with the Port of Felixstowe. 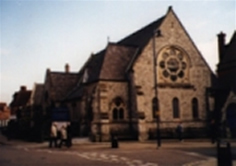 As well as the church activities listed below, the premises are used on a regular basis by a variety of local organisations and occasionally for Art and Photography exhibitions and Flower Shows. The Church is also a popular venue for fund raising concerts in aid of local charities. Trinity is a Fairtrade church. 9.15 – 11.15am ‘Open for You’ – term times only. For children aged 0-4 years with their parents/carers. Further information on these and other less regular events can be found on our website and facebook pages. This Church is in the Ipswich Circuit. A list of all the churches in The Ipswich Circuit can be found lower down this page.